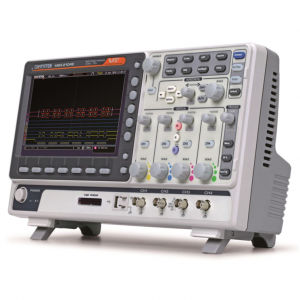 The MDO2000E Series Mixed Domain Digital Oscilloscope combines Time Domain and Frequency Domain Analysis in one instrument providing a Bandwidth of 200MHz, Sampling at 1GS/s in the Time Domain and a 500MHz Bandwidth Spectrum Analyser. The MDO2000E Mixed Domain Digital Oscilloscope also can be configured with a Dual Channel 25MHz Arbitrary Waveform Generator, a DMM and a Power Supply all integrated to provide a powerful analysis tool for many signal analysis applications. The MSO 2000E Series Mixed Signal Digital Oscilloscope combines Time Domain and a 16 Channel Mixed Signal input Analysis in one instrument providing a Bandwidth of 70MHz – 200MHz, Sampling at 1GS/s in the Time Domain and a 16 Channel Logic Analyser. 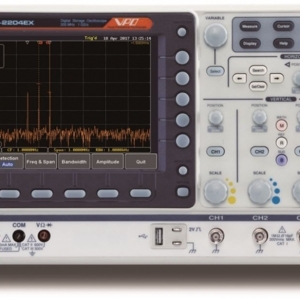 The MSO 2000E Mixed Signal Digital Oscilloscope also can be configured with a Dual Channel 25MHz Arbitrary Waveform Generator providing a powerful analysis tool for many signal analysis applications. The GDS 3000 Series Digital Oscilloscope combines advanced signal processing technology providing a a full-featured powerful analysis tool required to tackle complex measurement issues with ease. Features include Visual Persistance Display for a unique user experience,, Bandwidths to 500MHz with a Sampling Rate to 5GS/s.